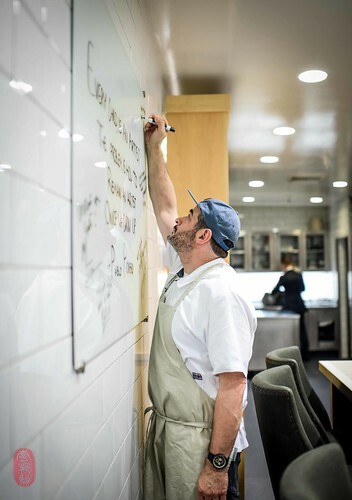 Since leaving Napa, Fox has relocated south to Santa Monica, where he is chef of two restaurants, Rustic Canyon and the recently opened Tallula’s. Cooking this year on day four, he is one of two chefs this year (and in the five years that I’ve been photographing this event) to be invited back as a guest chef at the Twelve Days of Christmas at The Restaurant at Meadowood. If fact is stranger than fiction, then nature is certainly more magical than anything humans could devise. And Fox conveys this brilliantly in his bold use of color in his cooking. 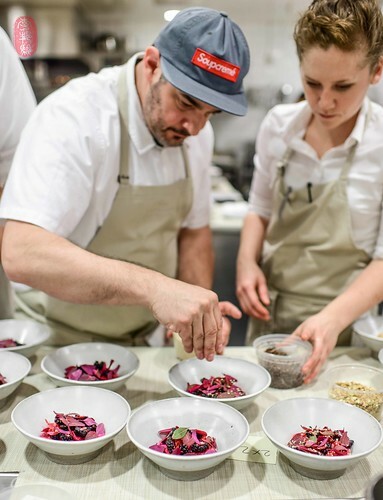 His opening course included a trio of vibrantly colored salads: beets and berries in deep purples and hot pinks; the glowing warmth of yellow spaghetti squash, with bright-orange trout roe; and a patch of green arugula hiding a cache of crispy porchetta. 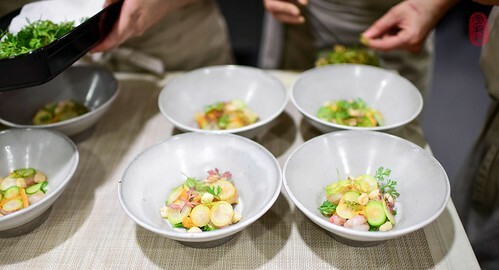 He also served a beautiful posole verde painted in pastels – a rainbow of thinly shaved radishes and garden herbs, echoed in the watery shades of shellfish, like blushing clams, pink spot prawns (from Monterey Bay), and peachy sea urchins. 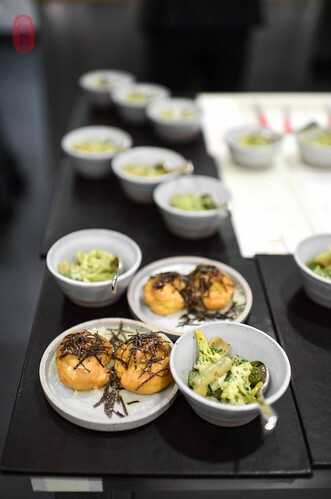 On the side were served crispy blue corn tostadas, fresh out of the fryer. This was my favorite Fox course of the night. 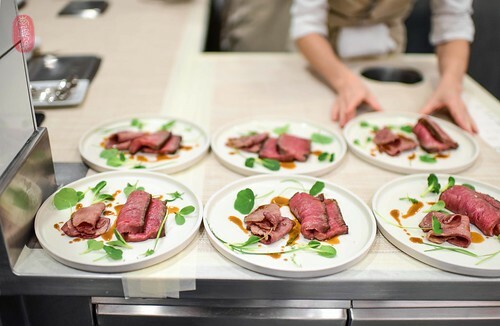 Telling “The Tale of Two Californias,” Kostow’s team brought their Culinary Farm to the dinner as well. 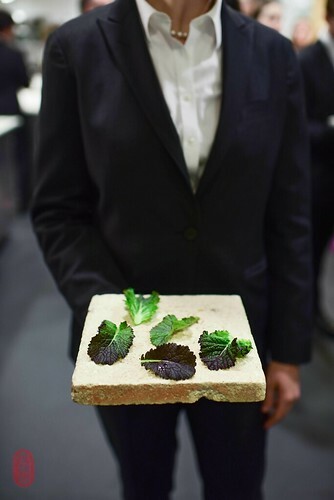 For canapés, The Restaurant at Meadowood presented dragon’s tongue, a fleshy arugula that turns deep purple at the edges, with bean miso (made by Nick Sobiek, one of the cooks). They also served a pea “spring roll”: young peas and their shoots wrapped in a pliable wrapper made of peas (only in California could you serve these fresh from the garden in December). 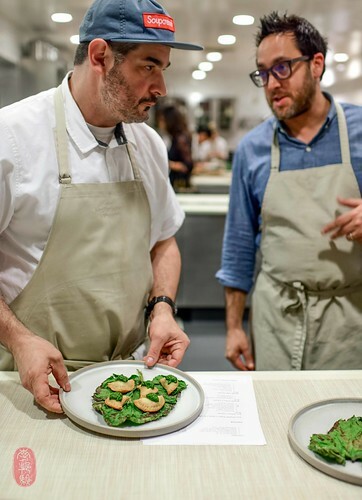 Kostow served one of the best dishes I’ve ever had at The Restaurant at Meadowood. I had it at the restaurant the night before the Twelve Days of Christmas started, and he served it again on this night with Fox. It appears to be a wedge of roasted celeriac. 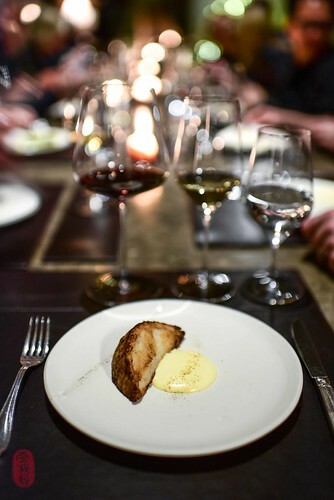 But it’s actually a wedge of cabbage that has been interleaved with buttery black cod – both whole pieces as well as a mousse of the fish with a little bit of scallop mixed in for structure. The molded half-domes (basically a bombe) are steamed, cooled to set, cut into wedges, and then pan-fried to give it a bit of color. The cabbage practically melts away, leaving only bit of its sweetness behind. All of it so tender that where the cabbage ends and fish begins, you can’t really tell. It’s fantastic. Fox ended the dinner with a colorful salad of citruses, served with a loose-crumbed ricotta cake, followed by marcona almonds rolled in lavender sugar. Below, you’ll find the menu from the fourth night of the Twelve Days of Christmas with Jeremy Fox. To see all of the photos from this dinner, CLICK HERE. Green peas, pea shoots wrapped in pea wrapper. Beets, berries, pistachio dukkah & orach. Spaghetti squash, preserved lemon, & trout roe. Garlic “bread” with black truffles. 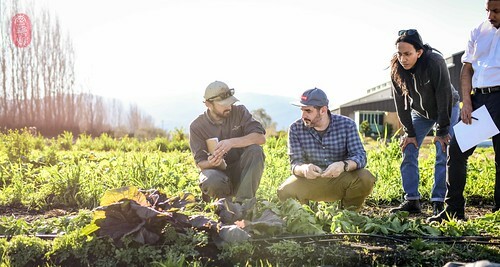 Photos: Jeremy Fox at the Culinary Farm with head farmer Zac Yoder; a colorful bowl of “Posole Verde” by Fox; Fox with his mushroom empanadas; dragon’s tongue with bean miso; Fox dressing a salad of beets and berries with toasted benne seeds; roasted cabbage and cod; aged beef course; garlic “bread” with black truffles and a side of cardoon giardiniera; Jeremy Fox signing the board; all-kitchen group shot with Jeremy Fox. ~ by ulterior epicure on December 20, 2017.